koi vs goldfish HOW ARE GOLDFISH AND KOI DIFFERENT? koi vs goldfish Goldfish and Koi may have some similarities, but they are definitely two different fish. The Goldfish (Carassius auratus) is over a thousand years old, and was created by the selective breeding of a type of fish known as the Prussian Carp. The plan was to develop different color mutations, and this idea was very successful. The changes in the fish were so distinct that the Prussian Carp and the Goldfish are now thought of as two completely different species of fish. Goldfish migrated to Japan and Europe during the sixteenth and seventeenth centuries. The background of the Koi contains a fish known as the common Carp. In fact, the Koi fish is a common Carp (Cyprinus carpio) that has been severely culled over time for color and pattern. Contrary to popular belief, the Koi is still a common Carp. All that is needed to prove this is allowing a group of carp to breed with each other at will for several generations. The natural and original color of these fish will reappear by the second or the third generation. 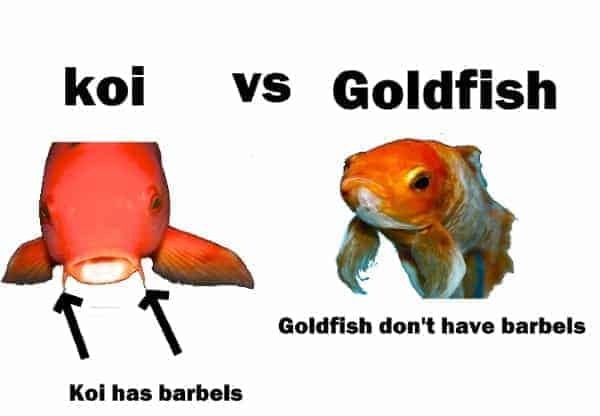 Goldfish are not as large as Koi. Their bodies come in an array of different shapes, and their fins and tails can be put together in several diverse configurations. Koi share a universal body shape, but have a wider variety of body colors and patterns than the common Goldfish. Koi also have a slender barbell on their lip that resembles a whisker. Even though Goldfish and Koi may look somewhat similar, especially when they are young, remember that each comes from a different genus of the carp. Goldfish and Koi are able to interbreed and will produce young fish, but these fish are always sterile. Are goldfish and koi fish the same thing? Goldfish are actually descended from crucian carp, while the koi have barbels, grow longer, and are in fact a fancy domesticated version of the common carp. Do koi and goldfish breed? Although studies have revealed that the hybrids are anatomically intact, they are sterile. Therefore, you can only get koi-goldfish hybrids by mating koi and goldfish; the hybrids themselves will not produce offspring. Also, the hybrids will not have barbels. koi fish origin The Koi fish has an interesting history. They are the national fish of the country of Japan, and a member of the carp family (Cyprinus carpio). This is why some people call the fish Koi Carp. Koi are also called warrior or samurai fish in Japan. These names have nothing to do with their disposition. In fact, it is safe to assume that most of the Koi you will see are lovers instead of fighters! Koi are also known as Nishikigoi, which means, “brocaded carp” in Japan and other locations. is rather redundant, as the word “koi” means “domesticated carp” in Japanese. are koi fish japanese or chinese Where Did the Koi Come From? There is some debate as to where the Koi originated. the Koi gradually moved into and through the rest of the prehistoric world. The fossils of Koi that are around 20 million years old were found in the southern part of China. habitats in the Black, Caspian, and Aral seas in Asia, and China is the true beginning of Koi fish. carp by king Shoko of Ro and from then on the fish became the subject of much Chinese artwork paintings. due to their resilient nature, this was the beginning of the Japanese Koi fish. from 265 to 316 A.D. The text describing them said that the koi fish patterns were black, red, white, and blue. Up until around 800 A.D., the common carp was raised in Japan as a protein food supplement. friends, and on and on until the Koi extended across the Orient. responsible for the fish doing well in so many places. Selective breeding during this time accomplished several different pattern variations of the Koi. The most common color during this period was the red and white Kohaku koi. for inclusion in an exposition, which was held every year. of the Koi, and started to keep them in outdoor ponds at their homes. Soon after this period, the fascination with koi spread around the world. Today, people are still captivated with these gorgeous fish.